Kaspersky Internet Security 2014 from Kaspersky Lab – the new version of Kaspersky Anti-virus with hybrid technology of the protection, optimized performance and enhanced security feature for online payment and online banking. Kaspersky Internet Security 2014 – Anti-Virus with integrated hybrid security technologies and optimized performance for the effective protection with high speed . The solution protects against all types of malicious software, network attacks , online threats. Includes advanced protection for secure online banking and online payments. Proactive technologies, signature-based detection and cloud protection with the help of the Kaspersky Security Network provides reliable protection for your computer and important information. Patch ‘A’ is installed through the update. Safe mode programs – activated. • To improve the safety of the program mode added security of a program: when Safe Mode programs is enabled, Kaspersky Internet Security 2014 automatically determines which programs are safe and secure and allows run only safe programs. • Improved functionality Secure Payments: now you can choose a web browser, which will open the sites of banks and payment systems. Also added to the list of popular websites for financial transactions, which include Secure payments automatically. • Improved functionality of Parental Control: added flexibility in configuring permissions to run games and programs. Added predefined templates Parental Control settings , the relevant age monitored users . • Simplified setup Kaspersky Internet Security 2014 : now for the settings are only commonly used parameters of the program. Added support for the latest versions of popular web browsers: now the security components (such as module testing options, Secure Payment ) support Web browsers Mozilla FireFox (version 16.x and above), Internet Explorer ( versions 8, 9 , 10 ), Google Chrome (versions 22.x and above). • Added protection against malicious software lock screen: You can unlock the screen by a certain combination of keys. The protective function of the software screen lock detect and remove the threat. • Increased efficiency of protection against phishing: the functionality of the Anti – Phishing improved and updated. • Improved performance of the program and optimized consumption of computer resources . 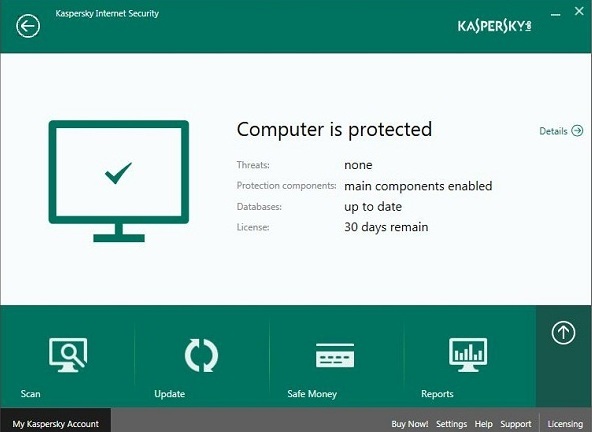 • The mode of restricted activity when idle computer: now when idle computer Kaspersky Internet Security 2014 uses less resources, which saves power when running on battery. • Significantly reduced the start of the program . • Increased speed of graphical user interface and reduced response time to user actions. • Improved reporting of performance and quality reports become more simple and intuitive . • The ability to participate in the “Defend friend” : now you can split a link to Kaspersky Internet Security with your friends and get bonus codes activation. – Support for the Connected Standby ( low-power mode, available in Windows 8 ). – Microsoft. NET Framework 4. – 512 MB of available RAM. – 1 GB of RAM (32 -bit) or 2 GB RAM (64 -bit).